In 1976, Mixed Blood was founded amidst an American theatre landscape booming with new ideas, approaches, and visions of what theatre could be and do. For Mixed Blood, that vision was—-and remains today—-grounded in creating an audience, a community, of people who otherwise wouldn’t be involved in theatre and the arts. At the core of that idea’s success is the dedication to removing any and every barrier to being part of the movement of Mixed Blood. We call that dedication Radical Hospitality. One important and universal way Radical Hospitality revolutionizes access is by providing no-cost admission for anyone. Admission is free on a first come, first served basis beginning two hours before every performance. But Radical Hospitality is far beyond no-cost admission. Mixed Blood strives to eliminate all barriers to access: from being the destination for people living with disability by offering free transportation, a fully-accessible building, supertitles, and more, to four Advisory Councils that lead us to find and eliminate barriers, discover ways to share our resources, and build catalytic relationships with the members of our greater community throughout the metro area and beyond. The firehouse is fully accessible, with adjacent disability accessible parking spots, projected supertitles for every show, audio description for all performances, mats for service dogs, ASL interpretation once per run, and tactile tours for people with vision loss. 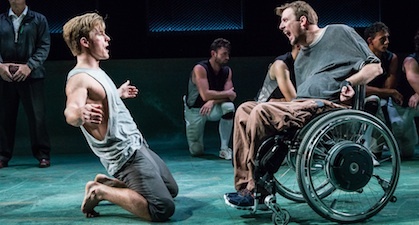 Free transportation to and from the theatre is available for people with disabilities, and Radical Hospitality allows anyone with a disability to reserve admission without charge. Since 1989, Mixed Blood annually has produced at least one production by, about, for, and with Latinos, performed in Spanish and English by bilingual actors. A Latino Advisory Council guides Mixed Blood’s efforts. In the past three seasons, Mixed Blood has expanded its mission to include trans directors, designers, actors, and box office and front of house staff. This effort deepened in 2018 with the production of Mermaid Hour: ReMixed and On Our Own Terms, a day curated with the support of our newly formed Trans Advisory Council.